Our 3 bedroom, fully air-conditioned, luxury private pool villa is ideally situated for a wonderful holiday in Orlando. Whether you are looking to relax by the pool or visit the local attractions our beautiful home is perfect for both. After a busy day at the parks, come home and relax by the private pool. With an extended decking area, there is plenty of room for both you and your family to put your feet up or go for a swim to cool off from the Florida heat. Fancy a day at the beach? Take your pick… With both the Gulf and Atlantic coast between 1hr to 1hr 30mins drive away, it is easy to take a break from the local attractions and relax on the beach. Florida is a golfer’s haven, with 100’s of top courses to choose from. With the Championsgate course only a 2 minute drive away and the excellent Celebration course 5 minutes away, you are never short from an array of fantastic courses to choose from. "It took us many months of looking to find the perfect holiday home and finally we found it. The beautiful Hamlet Estate at West Haven is a gated community with beautiful manicured gardens, children’s play area, including swing, slide and climbing frame & tennis courts for those energetic people. All the furniture in our home has been hand-picked to create a warm and relaxing atmosphere to give all our guests a holiday to remember. Ensuite - spacious and luxurious. With walk-in shower, decorated beautifully with sandstone colour tiles, oval sunken bathtub and 'His and Hers' wash basins. Bedroom 2 & 3 share second bathroom - Sink, WC, Bath & Shower. This exquisite large room is an ideal place to get the family together, relax or watch a film and enjoy a beautiful evening in. Includes:- 3 & 2 seater sofas, Coffee and occasional tables, Cable TV, DVD player, patio door to the private pool. Orlando is a golfers haven, with hundreds of top quality golf courses to choose from. Our beautiful holiday home is just a 1 minute drive to the Championsgate & Reunion Golf Courses. With the beautfiul "Celebration" golf course only 5 minutes drive from our home. Outside: With an extended decking area this private pool is just what you need to get the perfect tan. The pool area retains the sun all day long and is ideal for having those relaxing days. Enjoy a swim in the morning or evening in this 27'x13' pool. Or why not enjoy a glass of wine in the evening under our lighted patio area. 'The perfect way to end the day.' 4 Sunloungers, Patio table & Chairs. The Hamlet estate also has a Childrens play area - Swings, slide & Climbing frame. Utility Room: Washing Machine and Dryer are also located in the kitchen, with iron & ironing board. Cleaning / Towels / Linen / Maid service: The villa comes fully prepared with ample supply of towels and bed linen for all beds. Other: Family Room - (2nd Living Room) - An ideal room for relaxing or reading a book. Includes:- 3 seater sofa, 2 seater sofa, coffee and occassional tables. Formal Dining table and 6 chairs. The villa is in a gorgeous gated estate with everything you need. The management company should you need them are only a phone call away. There are shops not far as well as restaurants in abundance and all worth a visit. The villa itself was lovely and obviously looked after. The pool after the parks was a welcome sight and sitting out in the evenings was relaxing. I would have no hesitation in recommending this villa to anyone looking for a relaxing or as hectic a time as you want it to be. It was a great month and enjoyed the whole time. West Haven very nice area and handy to everything. We are coming back next year. Ideally situated in the heart of Florida the beaches on both the East & West coast are within easy reach. Gulf coast - approx 1 hour drive. Atlantic coast - approx 1 hour drive. 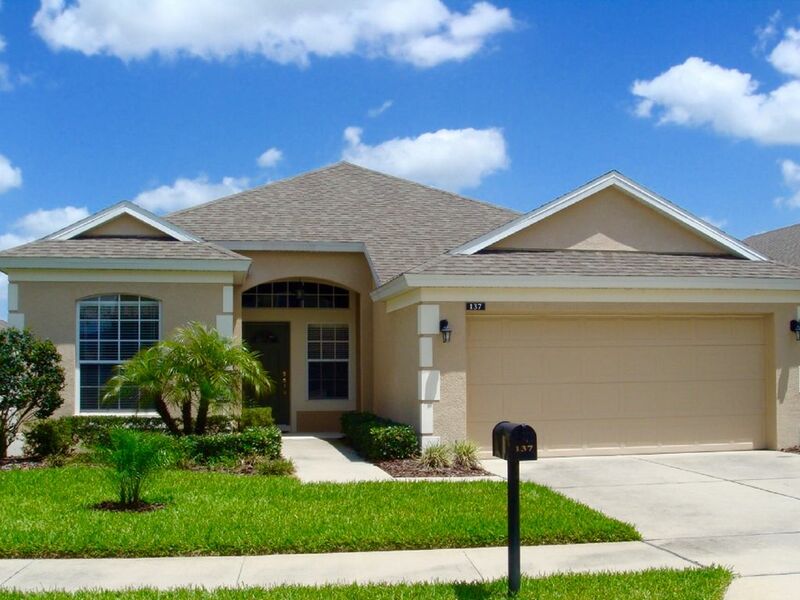 Our home is easy to reach from either of the 2 main Orlando airports. Publix supermarket, petrol station, bank, liquor store, 24hr chemist - 2 minutes drive at championsgate. Highway 4 (I-4) is a 2 minute drive, giving easy access to all the main routes into Disney World and is the main highway to Seaworld, Universal studios & Tampa. Changeover Day: Change over dates are flexible. Home to be vacated by 11am on day of departure - alternative times can be arranged with the owners Notes on prices: Additional cost for Pool Heating. Discounts available for booking over 2 weeks.